This review is about item#17659407. I am using it to illuminate the feet, but the LEDs are also cheap and it can be purchased because it can purchase multiple units. I'm hanging in the shed. I like it because it is very bright and light. Hue is also great greatly. We are planning to order additional items. This review is about item#17659416. Anti-rust paint is solid and drip-proof construction is also good. I diverted Negros Electric Works' Pilac to the steel frame, but since the frame structure matched, I could secure firmly. Although it is not used as a portable lighting device, the structure of the "left and right head swinging" of the frame should be strengthened a little more. This review is about item#17659425. 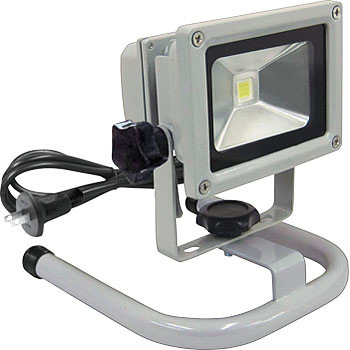 It is used as an auxiliary lighting when working. I could purchase it cheaply in the campaign, it was good. This brightness is sufficient with 10W. The light body is compact and you can choose any place to use lightly. I wish I had an ON / OFF switch. It is bright and good. I use it with a magnet that is sold separately. The outlet is short and it is troubled by the installation place. I'd like a switch on and off if possible.